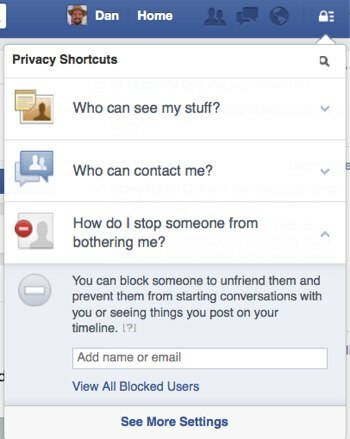 UPDATE 4/28/15: We have a completely new and updated guide to Facebook Privacy Settings. Click HERE to get our latest advice. The first thing you have to realize about Facebook: Nothing you put there is truly private. Yes, you can control how users see or don’t see your profile. But every time you like a product or even look at a page, the company itself is taking note. This doesn’t mean that some day Facebook will malevolently release your every click to the world. But it does mean that Facebook is not your private diary, and what you do on the website gets collected and catalogued. That's worth keeping in mind whenever you use the service. That said, Facebook is a great way to stay in touch and share small and big moments with family, friends and assorted other connections. The key is making sure you’re presenting the most appropriate profile possible to each friend. So let’s go over the various settings you can change to ensure pictures of your wacky jaunt to Vegas don’t end up at the top of your boss's news feed. Since Facebook tends to opt you in automatically to sharing information as new features are released, it's a good idea to check your privacy settings every few months to maintain the level of transparency you want. The following information was updated on March 12, 2014. When you log in to Facebook, in the top right corner are two different ways to access your privacy settings. Clicking the lock icon opens a drop-down menu that shows Privacy Shortcuts. From here, you can make a few key changes to your settings. In this section, you get three settings to control how your posts are seen on the site and by whom. Who can see my future posts? Your options here are Public, Friends, Only Me and Custom. What you set this to becomes the default sharing setting for all your future posts. It does not affect anything you've previously posted. We recommend you set this to Friends. If in the future you want to post something that you don't want all your friends to see, you can change this setting right in the post box. No need to come back to this default setting for one post. 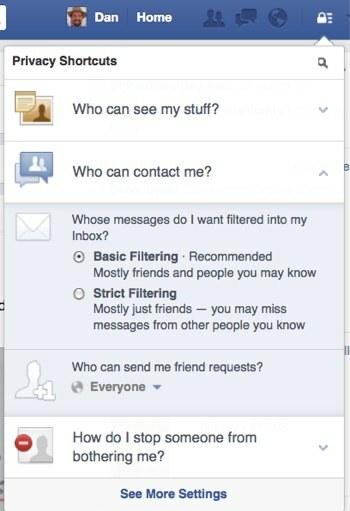 You can also group your Facebook Friends in lists and restrict your posts to those lists. Use the Custom option for that. Only set posts to Public that you are very sure you want out on the Internet forever. Public posts will be captured by Google and other web indexing services and made available to the world for all to see. Where do I review who can see or find things I've posted or been tagged in? This will take you to the Activity Log page. Here you can look at every post you've written, every photo you've uploaded, every friend's post you've liked and more. Basically, everything you've done on Facebook or been tagged as doing by others will show up here. As you go down the list, you can un-like posts you don't want to be associated with, take yourself off tagged photos and even see posts you've hidden from your personal timeline. You can also change who can see your posts and photos (i.e. custom setting) on an individual basis. And for your friend's posts you've liked and commented on, you can see the privacy settings on those. Didn't know that post you commented on was set to Public? You do now. What do other people see on my timeline? This will take you to a page where you can view your timeline the way others see it, even the public. You won't see much difference in your timeline view if you choose to see what it shows to different friends. This is mostly if you have set certain posts to be restricted (or thought you had). One thing that is of interest is what is public — for example, the header picture you set to be at the top of your timeline. That's right: If it's a picture of your kids, that is public. People who are not your Facebook friends can still send you messages. This is where you can change that. It comes as a surprise to many people that they have a Facebook inbox. It's hidden down in a few menus. First, click on Messages on the left column of your Facebook home page under your name and profile picture. On the Messages page that then appears, click on the downward arrow next to the word More and choose Unread. You will now see the messages you never knew you had. You have two choices for filtering what messages get to you: Basic (loosely defined as "people you may know") and Strict. What this boils down to is do you want messages from people who are friends of friends or not at all? Basic is more lenient with allowing emails; Strict is not. The default here is Everyone, because Facebook wants your network of social interactions to grow. But if you want to limit requests, you can always change it to only allow Friends of friends to send you requests. This one is simple. Just enter in the name of the person or their email. Facebook will unfriend them for you, stop them from starting a new conversation with you and prevent them from seeing any of your posts. Facebook doesn't like you to unfriend other users, and it provides a few alternate courses of action including messaging the friend to let them know they are bothering you as well as instructions on how to hide someone's updates from your news feed without unfriending them. If you later change your mind, click on the View All Blocked Users to see who you have blocked, and unblock them. You will have to wait 48 hours to reblock them again. Now that we've covered the basics of privacy settings, we can dive into a few more options that will make your Facebook experience more pleasant. Customize all your timeline settings. Now that you've mastered the basics, go down to the next section, Timeline and Tagging. From there, you can control exactly who sees what on your timeline, who can post to your timeline, and who can tag you in photos and posts. To check how people see your timeline, you can type any user’s name into View As. It’s a quick way to double-check that your boss doesn’t see your vacation pictures. To customize your timeline settings, click on the button in the far right corner to reveal a drop-down menu and select Privacy Settings. Who can post on your timeline? It's set by default to Friends, and the only other option is to allow only yourself to post on your timeline. This gives you the most control over what appears on your timeline. Review posts friends tag you in before they appear on your Timeline. If you are concerned about getting tagged in a photo that you don't want all your friends on Facebook to see, this is the setting for you. 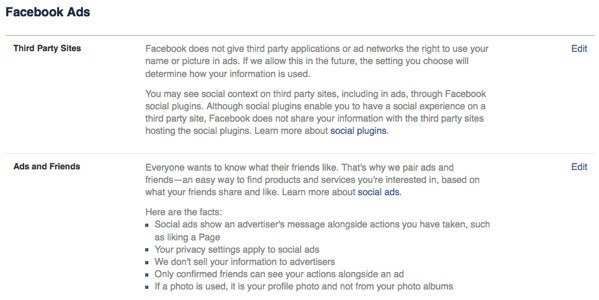 Once enabled, you'll have to manually approve any photo or posts you are tagged in before they appear on your timeline. Note that this only affects timeline; those updates will still appear in searches, the news feed and other places unless you un-tag yourself. Review what other people see on your timeline. As we mentioned above, it's a perfect way to check that your mother or boss won't see what you don't want them to. Who can see posts you've been tagged in on your timeline? & Who can see what others post on your timeline? These areas give you a great deal of flexibility, with options ranging from Everyone to Friends of Friends to custom lists. Using these two in conjunction with manually approving what photos and updates you've been tagged in goes a long way to keep prying eyes away from more sensitive Facebook updates. Review tags people add to your own posts before the tags appear on Facebook. This is an important option if you are concerned about a photo popping up on your timeline. 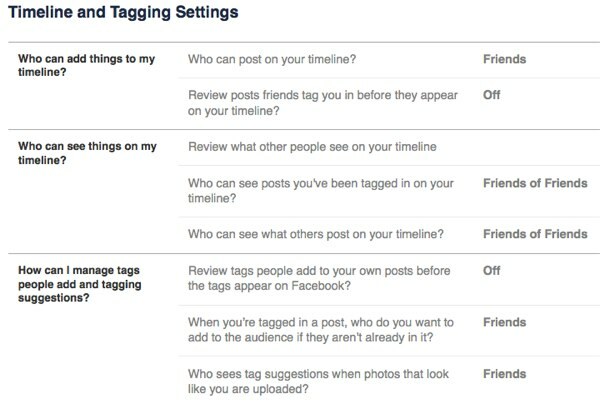 This applies only to photo tagging by your Facebook friends. You'll always be notified if someone who's not your friend tags you in a photo. When you're tagged in a post, who do you want to add to the audience if they weren't already in it? This one sounds more complicated than it is. Often a Facebook friend of yours will make a post and tag you in it. The option here allows all of your Facebook friends to see an update or photo you've been tagged in by someone they aren't friends with themselves (the Friends of Friends function). 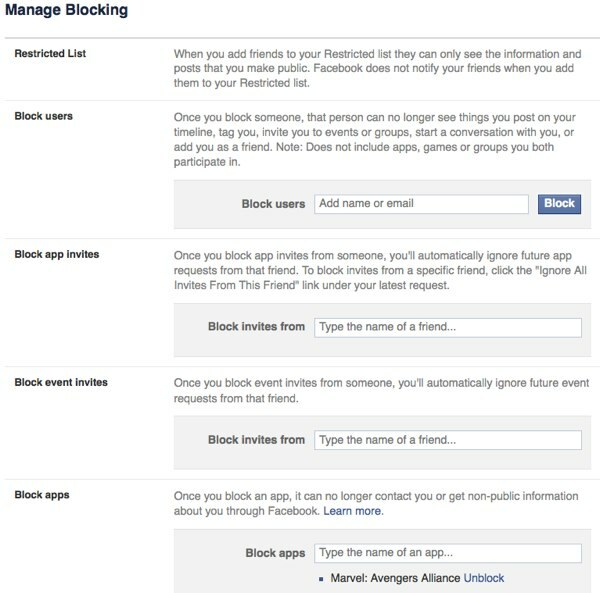 You can choose to remain tagged but have none of your other Facebook friends see that update, limit who sees that update to certain groups of friends, or you can outright block certain Facebook friends altogether by using the Custom option. Who sees tag suggestions when photos that look like you are updated? Facebook uses face-matching technology to suggest who you should tag in photos. It will only suggest people that are on the user's friends list. If you don't want to show up as an option when your friends are tagging photos, set this to No One. If you don’t want to un-friend somebody but you don’t want them to see all of your information, you can add them to the Restricted List. This means they can only see your public information, but they have no way of knowing you’ve limited their view (unless they happen to see someone who isn’t restricted browsing your profile — but that’s probably not going to happen). After you finish adjusting the blocking section, click over to the App Settings section. It’s not quite as obvious as changing your timeline settings, but apps often gain a lot of access to your information, and they can do things you might not want them to: collect data about your location, post on your timeline and more. Click Edit next to a listed app to gain all sorts of controls, including who can see that you are using the app to removing the app altogether. If you want to remove an app, click on the X to the right of the Edit button. 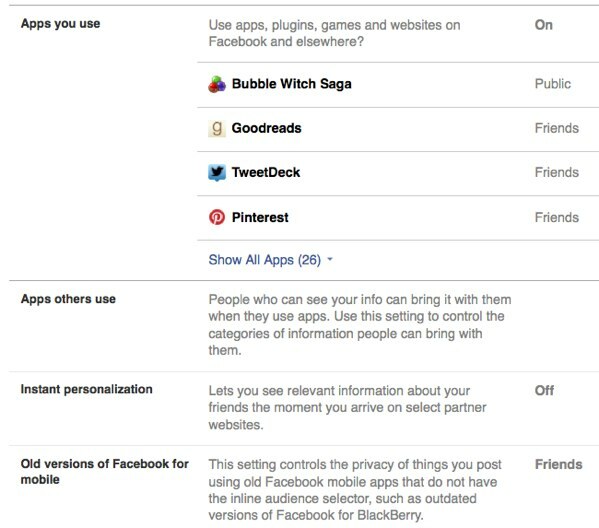 This is where you can control what apps find out about you when you are the friend of the person using the app. Choose exactly what information apps can pull from your profile in 17 different categories. Facebook provides profile information about you to outside sites to "personalize your experience." That's Facebook code-speak for looking at your profile to deliver ads and content the company believes you'll be more interested in. Sites listed include Bing, Yelp, Zynga and others. If you don't want these outside sites to pull your profile Facebook, click the checkbox in this section. You'll get two warnings before it actually happens, so be sure to click through all boxes. If you use an older version of Facebook mobile (such as outdated versions of Facebook for Blackberry), you won't be able to select who can see your updates when posting from that app. You can set it here instead. Facebook is now a pervasive marketing and advertising tool, and all sorts of businesses want access to your preferences so they can better target you. It’s kind of impossible to use Facebook without leaving some sort of trail of breadcrumbs for advertisers, but you can reduce this in a couple of ways. First, go to your Ad Settings, located right under App Settings. If you don’t want Facebook to use your preferences in ads, click on the Edit button on the right of the Ads & Friends and Third Party Sites and then change those settings to No One. That means your name won’t get used in an ad for something that you’ve liked. However, this won't prevent sponsored posts from companies you've liked — those items that appear in the news feed, not ads — from being sent with your name. And you'll still receive sponsored posts from companies your friends have liked. If looking at targeted ads gives you the heebie-jeebies, you can dial down the frequency of the ads by manually hiding stories by each company that targets you. It’s a cumbersome task, but it allows you to get rid of ads that are particularly annoying. You can do this by clicking the small X in the upper right corner of an ad. Taking these steps will help you control who sees your Facebook page, but you should check every so often to make sure your privacy settings have remained the same. Still have questions? Leave them in the comments below, and we'll see what we can do to find answers for you. When I go to this function, I press “Limit Old Posts” and a confirmation window pops up. I press “confirm” and nothing happens. Tried this with Chrome and Firefox. Are the old posts on your timeline all set to “Friends”? If so, it probably is fine. The easiest way to see if it is working is to create a new post on your timeline and set it to “Public”. Then click “Limit Old Posts”. If the post has been changed to “Friends” then it worked. That worked. Thanks for taking the time to respond. PhD psychologist or etc. They said they couldn’t do that or even ‘edit’ it - (one made a grammatical error she was embarrassed by… used “a” instead of “an” in front of a vowel. Please help. Thank you! What setting is supposed to becshowin on my post for people to see after i post is it suppoded to read turn off notifications or be on turn on notifications i dont get it all my post have either one or the other i want them to be on on so what do i do? There are some browser add-on’s which block tracking cookies. I’ll leave it to the reader to investigate, as what’s available is browser specific. I know I can ensure the photo is not publicly visible on MY timeline, but I cannot limit the tag’s visibly on my friend’s timeline if it’s a public photo, right? My only option would be to untag myself entirely? (Basically, I wish my friend wouldn’t post his photos publicly, but that’s beyond my control. I suppose I can always untag myself there and then share the photo on my timeline with my own tagging?) What a mess. Yes, you would need to remove the tag entirely or it will remain public. Have you asked your friend not to post publicly? Often, when I point this out to friends they didn’t even realize they were posting publicly and are happy to change their settings to post for “Friends” or “Friends of Friends”. Hi, I get annoyed if an FB friend/family comments on all pictures and posts I publish or been tagged with… How can I disable the ‘comment’ box in the posts or pictures? Just to prevent anyone to comment on the post or picture, specially if they are not tagged on the said items. They can still find me on Facebook? I set my privacy settings in the way you also described here in this article, but people I don’t know can still search for me and find me . That is, I set it only to Friends (who can look me up) and selected Off in the search engines section. Are there any additional settings we are not aware of ? Any thoughts on why the audience selector refuses to work? As a result, my photos are now public. There is no reaction when I press the icon for the audience selector. Please assist. Does one Check or Uncheck the boxes so Info doesn't show? in “Apps other use” under App Settings? It is not clear if Check mark next to each item allows the info to brought over or does NOT allow the info to be brought over. I believe fb made it extremely unclear. Is there any way to hide the my likes and comments on others’ photos and statuses from showing up on my friends’ feed? I’m speaking of those I make on pages of non-mutual friends. I’m getting annoyed with messages from family who say, “Why did you like that?” or “Are you sure you meant to like that picture?”. Yes, I did, and I don’t want to unlike it. I’ve asked people to please edit their settings on my profile so they don’t see them, but a lot of people pay no attention to the request. I’m really frustrated with FB for taking this control away from me like it used to be. Hi, i noticed that searching through some people profiles, that are not my friends i can like their posts, but my posts can be liked only by friends, for the rest only appears the share button. So, how can i change it, my photos are public but can be liked only by friends, thanks! I tried to look up someone. my picture came up on their page I don’t want them to see it how do I get it off? Can you be more specific about where your picture came up on their page? Your picture shouldn’t appear just from looking someone up. I went to my custom list of who can not see my posts and I’ve put about 15 people the privacy list but why is it that they can still see my statuses? I don’t understand because it use to work but it doesn’t anymore.Help me please ! Can they see posts you’ve made since they were added to the list or is it past posts they can see? When you post, are you sure your individual posts aren’t listed as “Public”? How do you know they can see your status? Why not just de-friend them if you don’t want them seeing your posts? The default is to have a check next to your friends’ names. If you set them to “Close Friend” (hover mouse over his/her name), then a star appears next to the name. Set them to “Acquaintance” and a little list icon appears next to their name. So, what’s the practical impact of changing a friend’s setting? Facebook, in an attempt to ensure only the most relevant information appears in your newsfeed, edits out many posts, even those from your friends. By changing a friend to “Close Friend”, all posts will be shown. Setting to “Acquaintance” means that “Only Important” posts (as deemed by Facebook) will be shown. In my experience, Facebook does a pretty crappy job at determining what’s important to me. For example, when my wife posted about one of our mutual friends (in real life and on Facebook) passing away, Facebook did not deem that important enough to show in my newsfeed. As far as I’ve been able to determine, there’s no way to set your account to receive “All Posts” from everyone or only “Most Important” from everyone, you have to change the setting friend by friend. I suspect that the blanks are due to the person’s privacy setting. If they restrict friend requests, that button is probably hidden. 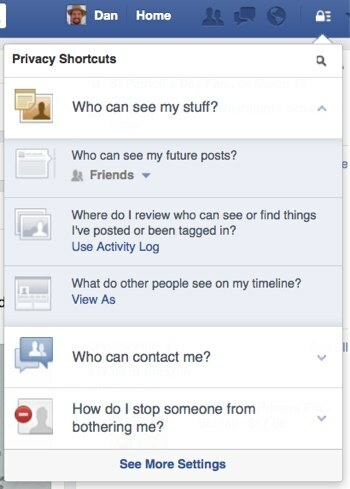 Your “Like” Settings mirror your overall privacy settings. If your post privacy is set to “Friends”, then your Likes can be seen by friends. However, there are two exceptions to this. One is that if you Like something one of your friends posted, then the privacy settings for that post will be whatever your friend has, not your settings. For items that you Like directly (for instance, if you go to our Techlicious Facebook page and “Like” it, which you should, of course! ), you can change the individual Like settings from your profile. Scroll down to your Like section and hit the little edit button. That will let you customize the privacy for each of your Likes. It appears that you can edit privacy for “categories” of Likes, but not for individual Likes. have no idea why they would do it that way, since it seems to be a relatively useless way to control things. If I don’t want a certain number of people to see certain photos or check-ins, will they still be able to see the same photos/check-ins, etc. on their newsfeed when they are posted…? Seems like a pointless option if they’ll see it when posted. If I lock my "Likes" are they still visible on friends' Newsfeeds? I REALLY need your help on this one…I have been searching comments here and don’t have a clear idea of what is actually the case. If I padlock my “Likes” for pages I have recently “liked” to “Only Me” on my Timeline, can they still be shown on the Newsfeed? I have people commenting on things they have seen on their newsfeed and want to know if my privacy will be violated on the newsfeed even if these are kept off my public timeline. It’s very difficult to figure out exactly what Facebook is doing with Likes privacy. Your best bet is simply not to like anything that you wouldn’t want others seeing. That said, why would you Like something that no one else could see? What would be the point of “Liking” it? I often “like” pages or comments etc but it’s not so the world can see that I liked it, it is so the owner of the page or comment will know that I liked it. I get so annoyed when I like something or even rsvp to an event and within seconds someone says “oh I saw you rsvp’d to—-” or “Hey I liked that page too”. I feel people are following my actions and that is not comforting. Many things that I have set to “only me” still show up on the live feed ticker on everyone’s page so everyone sees it. It may be a private thing on my timeline, but the ticker still shows it to everyone. How can I stop my actions from showing up on the ticker???? I fully agree. If I “like” something, it’s to tell the poster that I liked what they posted. It’s not to tell everyone I’ve friended about this. Error on Who can post in my timeline? I already set “who can post in my timeline” to “Friends”, but they can’t see field box and can’t post/write anything in my timeline. What’s happen? Hi, a friend of mine got unfriended on fb.. Now I’ve added her but we want to make sure that the mutual friends don’t get to see that we’ve added each other on their news feed..! Any way we can tackle this.! I’m not clear on what you’re looking to do. Do you not want your mutual friends to see that you’ve friended each other? You can change the privacy settings on your friends list to allow only certain people to see who your friends are, but you can’t do that on a friend by friend basis. That is, you can limit your privacy so only “Tim” can see your friends, but you can’t let Tim see all your friends except your secret friend. Will this come up in my friends newsfeed? I mean, if I become friends with someone on facebook, will that come up in my friends newsfeed. Also, if they were to go on this persons profile, that I’ve just added, will they see that I’m a mutual friend? Even if I’ve selected that only I can see my friendlist. - No, they should not be notified when you change them to an acquaintance. - You can’t get it to show “Add Friend”. That is determined by your friend’s privacy settings and relationship of the person viewing your friends list to that person. That is, if that person’s privacy settings say only “Friends of friends” can make a friend request, then someone who deosn’t have that relationship to them won’t see the button. I hope I describe this correctly. A lady friend is getting harassed with constant posts/invites from this “Ariana Grande”, blocks same, but then the next day (or minute or hour) another comes in with a SLIGHTLY different spelling (ariaNna grande, ariana el-grande, etc). She’s overwhelmed with blocking variations-on-a-name repeatedly (she showed me her massive blocked list), has tried the ‘block on timeline’ option, and everything else and has basically given up. Any ideas anyone? Thank you. Can you clarify what it is she is trying to block? Is it friend requests from this person? Is the person posting on her timeline? Changes to her privacy settings should be able to resolve most of these issues, but I’m not clear on which issue it is that needs to be resolved. If i put a person on my restricted list so they cant see my future posts, will i still be able to see theirs? If you restrict someone from seeing your posts, that doesn’t affect you being able to see their posts. You can also change your settings so you DON’T see their posts, if that’s your desire. As an aside, I would recommend being very careful about posting anything on Facebook you don’t want a particular person to see. You never know when an unexpected quirk in Facebook will reveal things you intended to keep private. It wouldn’t be the first time something like that has happened on Facebook. I added a friend to the restricted list. After sometime, i decided to remove him from the list and now he can’t see any of my posts. How do I fix this? I’ve tried removing/adding him to my friends list but same thing happens. Please help. Thanks. Facebook has algorithms that determine which posts you may be interested in seeing based on past interaction and other factors. It’s possible Facebook has determined that your posts wouldn’t be interesting to your friend and isn’t showing them. If your friend goes to their friends list and changes you to a “Close Friend”, then they should automatically see all of your posts. It’s also possible you removed them from your restricted list but still have them blocked in your post privacy settings, so you may want to check there, as well. I have my photos set to friends or friends only. I always have and they’ve never shown on my public profile before. I recently checked and ALL of my photos are showing regardless of the setting. I did some research on FB’s site and it seems to be a BIG problem, but they haven’t acknowledged the issue as I can tell. Do you know anything about this? At least, I would think that is what you meant since this column is about increased privacy. “Who can see your future posts? Today I discovered that someone on my friends list “shared” a family photo I had uploaded. While I was okay with it, I realized that there was a “share” feature under the photo on her page which means her friends could be sharing my family photo to their friends and so on and so on. How do I get rid of the share option. Doesn’t that option defeat the purpose of having privacy settings? The answer to your question (and to Elizabeth Ann’s below) is that, in our limited testing, photos appear to retain the original privacy settings, even when shared. So, for example, if you share a photo with privacy set to “Friends” and then one of your friends shares it as “Public”, it will still only be visible to your friends. Take all this with a grain of salt, though. We haven’t tested this in all scenarios and you never know when Facebook may make a change that impacts the privacy of previously shared photos. So it’s always good Facebook policy to simply not share things that you would be deeply upset if they somehow became public. I should also add that once you share a photo, there’s nothing to prevent someone from simply copying your photo and sharing it wherever and however they like, regardless of your Facebook privacy settings. I am in a private group. The admins get upset when you “share” a picture. I was under the impression that since it was a “private” group the things shared there don’t show up as having been shared. They are under the impression that if you share a picture that non members kind of get a back door in inside the group. I would like a professional opinion to clear this up! I have a regular “page” and when people share things from it I can go and see that it has been shared 100 times. I can read maybe 25 of the comments on shares, the people with public profiles, but anything set to private just doesn’t show up. That is why I am confused. Although my privacy settings show that “friends” can post on my timeline, there is no place for them to write? What should I do?